Recently, we shipped the R1 2019 release of Kendo UI. To help developers understand the impact of this release, we hosted a release webinar that walked through the latest features. This blog post is a summary of the webinar as well as answers to questions asked by attendees. The webinar was hosted by Eric Bishard, Carl Bergenhem, Alyssa Nicoll, and myself (John Bristowe). Don’t worry if you didn’t get a chance to watch it live. We’ve posted it to our YouTube channel. In fact, you can watch it now! During the webinar, we asked attendees to ask questions and offered the very cool drone as a prize for the best one. The winner is Bill Schubarg. Congratulations and thanks for your great question! What are the jQuery requirements for the latest version of Kendo UI and/or its upgrade path? A list of prerequisites is available on our website. The current official version of Kendo UI requires jQuery 1.12.4. Usually, each newly released jQuery version introduces breaking changes and is not compatible with the existing Kendo UI versions. In such cases, use the previous jQuery version until the next official Kendo UI version that resolves the issue is released. Normally, the jQuery version that is shipped with the Kendo UI service packs is not changed but is updated in major releases. Does the new DateRangePicker widget support different cultures? Yes, we do offer localization/globalization throughout all of our widgets, including the DateRangePicker! You can read more about this support on our website: Localization Overview. Does Kendo UI for Vue support mobile development? Does the Grid component in Kendo UI for Vue have a pop-up editor? The Grid component wrapper supports editing with a pop-up editor. At the same of this writing for the R1 2019 release, the native Grid component does not support editing through a pop-up editor. Thanks to everyone who joined us for the webinar, we received a lot of great feedback. 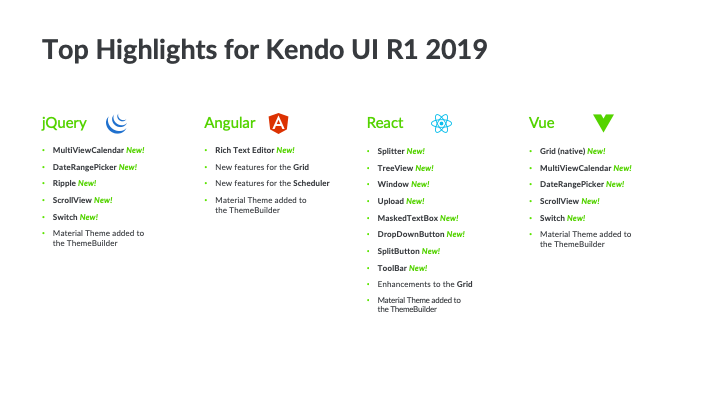 We hope you love the new features and improvements we've made to Kendo UI in the R1 2019 release. Please feel free to leave your thoughts in our Feedback Portal or in the comments below.